Enlarge View 15 images in sequence. - Vol. 1, no. 1 (Sept. 10, 1942)-v. 5, no. 22 (July 28, 1945). - Published at the Minidoka Relocation Center established by the War Relocation Authority for civilians of Japanese ancestry. The Minidoka irrigator . (Hunt, ID), May. 22 1943. https://0-www.loc.gov.oasys.lib.oxy.edu/item/sn84024049/1943-05-22/ed-1/. 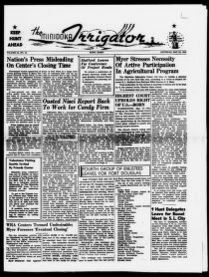 (1943, May 22) The Minidoka irrigator . Retrieved from the Library of Congress, https://0-www.loc.gov.oasys.lib.oxy.edu/item/sn84024049/1943-05-22/ed-1/. The Minidoka irrigator . (Hunt, ID) 22 May. 1943. Retrieved from the Library of Congress, www.loc.gov/item/sn84024049/1943-05-22/ed-1/. Minidoka snapshots. "Block 6" 1 print : color lithograph ; sheet 26 x 28 cm. | Print shows barracks, guard tower, and barbed wire at Minidoka War Relocation Center, Jerome, Idaho. Minidoka snapshots. "The enemy" 1 print : color lithograph ; sheet 26 x 28 cm. | Print shows silhouette of girl jumping rope against wall of barrack at Minidoka War Relocation Center, Jerome, Idaho.